Hydrangeas are a near-perfect plant because they bloom six months out of the year and are relatively easy to grow in pots, indoors or the yard. Sold in almost all local nurseries and even at grocery stores like Trader Joe’s they’re not even expensive to buy. Plus, think about the gorgeous blooms you can cut and display around the home. Even when they’re not blooming, the lush green foliage can be pretty spectacular. Location is critical because too much sun can result in wimpy blooms and a struggling plant. Most hydrangeas thrive in morning sun though the closer to the Southern California coast you are, the more sun a hydrangea plant can handle. If your house is inland, even in San Diego, a north-facing or an east-facing spot is best to protect them from too much sunlight. Hydrangeas won’t do well in heavy shade as the blooms will struggle and isn’t that the point? 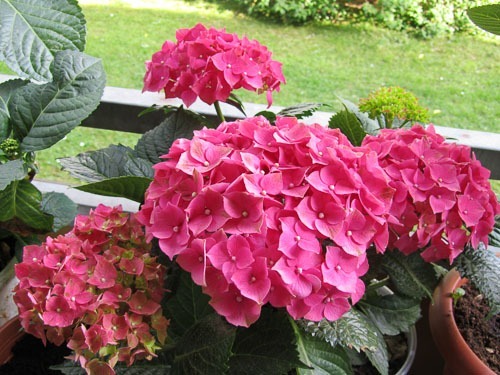 Hydrangeas can also thrive in containers though you’ll need to take extra care to avoid water evaporating out. A good rule of thumb is to stick your finger into the pot about two inches down. The soil should be moist, not sludgy, and if it’s dry then add more water. Fertilize them twice in a growing season. The name hydrangea stems from the Greek word “hydro”, or water, so it’s no surprise that these gorgeous plants love it. Without overwatering and by keeping the ground cool using mulch, water is the key to keeping these plants blooming happily so make sure that where you plant them, there’s suitable irrigation. Pruning is another thing to be mindful of. Deadheading (cutting off dead flowers) hydrangeas, like a lot of other flowers, promotes more bloom growth. Be sure to only prune dead flowers and branches as cutting off just old wood may also cut off the bulbs meant to bloom in the new season. Some suggest not pruning hydrangeas at all in the fall, winter or spring for this very reason. Hydrangeas are actually deciduous and lose their leaves in the winter and if you have a new plant that’s little and, perhaps, unfamiliar to your gardener they may pull it out thinking it’s dead (been there). They will look a little bit sickly, except for one variety called oak leaf hydrangea will sport red and orange fall-like leaves. If you happen to live in a place where it snows (yes, it does snow even in inland San Diego), consider planting hydrangeas in pots and moving them indoors during bursts of really cold weather. Otherwise, make sure the roots are insulated with mulch. Hydrangeas are generally broken down into two groups: mopheads and lacecaps. 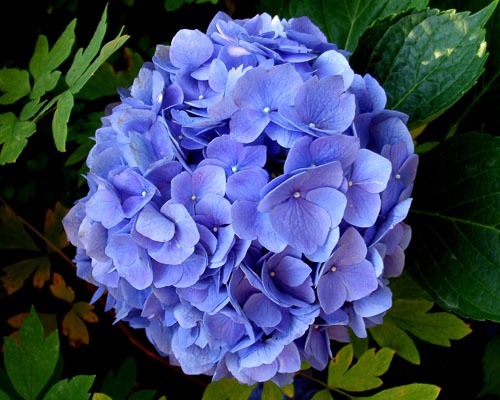 Mophead hydrangeas are typically rounded clusters of showy blooms of blue, pink or white. Most mopheads bloom in the late spring and summer though some bloom randomly year-round in Southern California. Mophead blooms can reach up to 14 inches in diameter! Lacecaps (shown above) have small flowers and look sort of flat and empty in the center. And, within the two groups are a quite a few species and varieties. The leaves can even vary in color, too. Though in Southern California it’s pretty easy to buy either blue or pink mophead hydrangeas, you can change pink to blue and blue to pink or even deepen the color shades. It’s actually quite simply done by adjusting soil pH. This technique doesn’t work with white mophead flowers, however. The pH of the soil determines how much aluminum is available to plants. 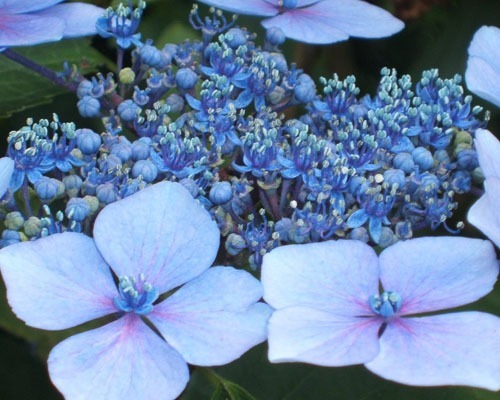 Soil with low levels of aluminum produce pink flowers (pH about 6) while soil with high levels of aluminum turns mophead hydrangea flowers blue (pH below 6). Soil pH around 6-7 produces flowers that are typically purple or a mix of blue and pink on a single shrub. To make the soil more acidic for blue hydrangeas, sprinkle sulpher over the garden soil (usually about 1/2 cup) at the base of the hydrangea and water it in. For more basic soil resulting in pink hydrangeas, sprinkle about 1/2 of lime on to the soil at the base of the hydrangeas and water it in. Patience is key, because the process may need to be repeated a few times over the span of months in order to achieve desired results. Note that companion plants may be affected by changing soil pH so consult your gardener or local nursery to double check if anything nearby may be affected. Part of the reason for growing these beautiful blooms is to display them proudly in vases, but they often don’t last long after cutting. To prevent quick wilting, try these two preservation methods. Buy alum in the spice section of a major grocery store. Cut the hydrangeas on a cool morning and drop the stems immediately into water after cutting. As you are cutting the stems to the desired height, dip the freshly-cut stem into powdered alum. Arrange the stems in a vase with water. Even though the alum washes off, for whatever reason, people say this works. Alternatively, after cutting hydrangeas, place the stems immediately into a container full of water per the method above. Boil water, let it cool for a few minutes and then pour it into a safe container. Cut the hydrangea stems to a desired length and plunge the ends into boiling water for 30 seconds or so. Next, arrange the flowers (immediately) as desired in a vase with room temperature water. It’s best to buy hydrangeas when in bloom because it’s not uncommon for retailers to accidentally mislabel them. Plus the bloom you start with may not be the bloom you end up with because the color is so dependent on the pH of the soil, as mentioned above. It’s extremely important to consult your local nursery about which kind of hydrangea will grow well in your yard. Some can actually get quite big, even up to 12 feet tall and wide! Which types of hydrangeas do you have success with in your yard?